Let’s return to our discussion of cystic fibrosis. 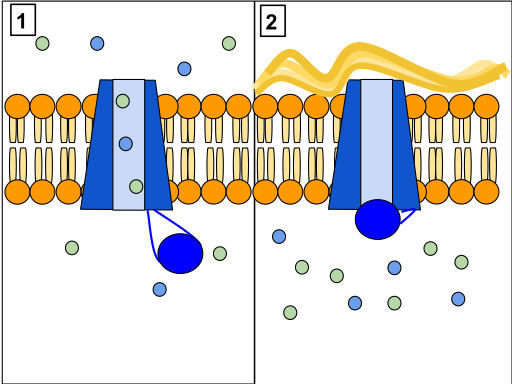 Cystic fibrosis (CF) is caused by a defect in a single transmembrane protein: cystic fibrosis transmembrane conductance regulator (CFTR), as seen in Figure 1. This regulator is a chloride ion channel that crosses through the plasma membrane. This channel is specifically active in epithelial tissues where it normally helps produce thin mucus via the movement of water. When mutated, the channel does not work properly and mucus becomes thick and viscous. This in turn leads directly to many of the symptoms of CF: thick, sticky mucus, frequent chest infections, and coughing or shortness of breath. Figure 1. Panel 1 shows a properly working CFTR protein. Panel 2 shows a malfunctioning CFTR protein. Cystic fibrosis is a difficult disease to treat. As we mentioned at the beginning of the module, patients with CF often suffer lung infections and sometimes require lung transplants. In addition to this, many CF patients are on one or more antibiotics at all times—even when healthy—to suppress infection. Several mechanical techniques are used to dislodge sputum and encourage its expectoration. In the hospital setting, chest physiotherapy is utilized. As lung disease worsens, mechanical breathing support may become necessary. Bi-lateral lung transplantation often becomes necessary for individuals with cystic fibrosis as lung function and exercise tolerance declines. Gene therapy has been explored as a potential cure for cystic fibrosis. Ideally, gene therapy attempts to place a normal copy of the CFTR gene into affected cells. Transferring the normal CFTR gene into the affected epithelium cells would result in the production of functional CFTR in all target cells, without adverse reactions or an inflammation response. Studies have shown that to prevent the lung manifestations of cystic fibrosis, only 5–10 percent the normal amount of CFTR gene expression is needed. Finally, a number of small molecules that aim at compensating various mutations of the CFTR gene are under development. About 10 percent of CF cases result from a premature stop codon in the DNA, leading to early termination of protein synthesis and truncated proteins. One approach to combating a faulty receptor is to develop drugs that get the ribosome to overcome this premature stop codon and synthesize a full-length CFTR protein.